As the ‘househusband’ in this all-male abode, I cook daily. 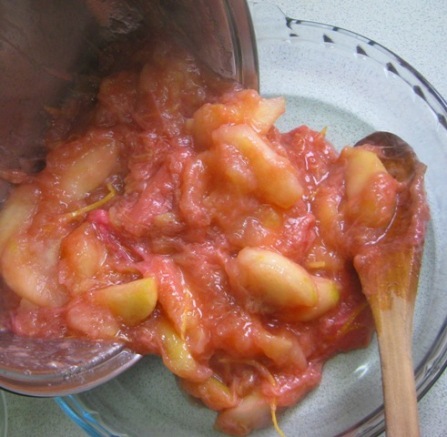 Once or twice a week I make something sweet to supplement the stewed and poached fruits that my father likes. My son is not really a dessert person at all, and rarely eats sweets, which is not a bad thing. He certainly doesn’t share my dessert genes. 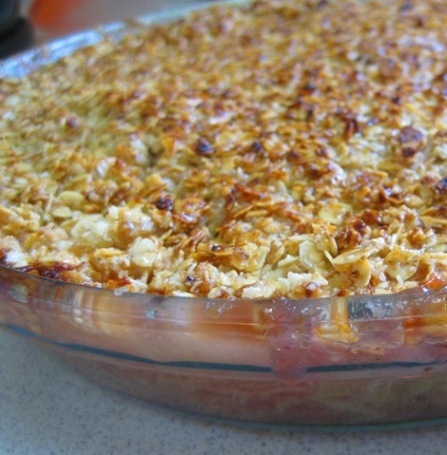 I decided on making a ‘crumble’ to ward off the outrageously cold weather here in Sydney. Granny Smith appleswere peeled, cored and sliced, and steamed with a tiny amount of water. I folded in a jar of home-cooked rhubarbthat I had taken out of the freezer, plus some sugar, and a good amount of zested lemon peel for an aromatic lemony zing. I melted some organic butter, and folded through some oats and some raw sugar. That’s the ‘crumble’ part. I make all sorts of toppings, sometimes the flour, butter and sugar variety which, I guess, is more traditional. Sometimes I make a grain-free topping out of ground almonds, puffed amaranth (kiwicha), butter and raw sugar. That’s a wonderful one to serve on Ekadasi fasting days. I have even made dairy-free toppings using a mild olive oil – nice actually. 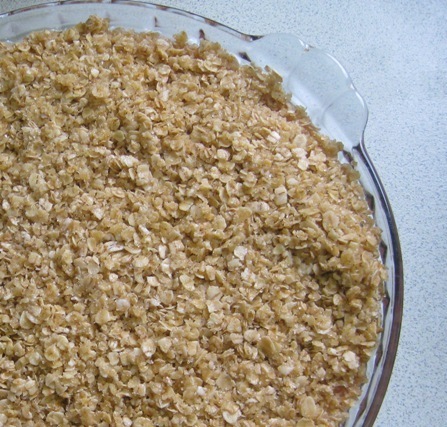 So that’s our crumble all poised to go in the oven, filling a pyrex pie dish pretty much to the brim. There will be bubbly spill-overs (for that rustic crumble look) so I placed the pie dish on a pizza tray to catch the drips. I was right. In the preheated 190 degree C oven, the filling bubbled and dribbled slightly. I increased the heat to about 200 C and then finished it off under the grill. Then, after the mantras for sanctification were intoned, I dug out one of my Mother’s crystal bowls and served a generous portion for no-one in particular (yeh, right Kurma). I drizzled the obligatory vanilla custard, caught in generous mid-pour as hoped, for our ‘hero’ shot. Not as easy as you think, as anyone that has taken food photography would know. A true winter-warmer! I can hear those global digestive juices gurgling from here.